In 1992, a roomful of people gathered to lay out the future of a new national park flowing through the heart of the metro, the Mississippi National River and Recreation Area. Designated just a couple years before and despite significant odds (a story in and of itself), the new "partnership park" — the only one dedicated to the Mississippi in the country — was owned not by the National Park Service, but the 25 cities and townships throughout its 72-mile stretch. Protecting and managing its unique natural, recreational and historic values needed to be a coordinated effort, with the fate of the park placed squarely in the hands of Minnesota and the Twin Cities rather than Washington D.C. But at one of the first public meetings to create a management plan for the park, a few "river rats" looked around and felt a bit out of place. While many people representing business and government interests were in attendance, there weren't many people like them: people who loved the river and were willing to speak on its behalf. That's when Friends of the Mississippi River was born. Officially incorporated in 1993, FMR has grown from an initial handful of founders (including Peter Gove and George Dunn, who continue to serve on our board of directors) to engage over 5,000 people annually as river advocates and volunteers — at community meetings, the Capitol, and in hands-on river protection and restoration projects. Likewise, our headquarters has grown from a walk-in closet to a half-floor of a downtown St. Paul building with 19 staff in four departments (water quality, river corridor and land-use, land protection, and stewardship and public engagement). We've detailed many of our accomplishments in a special annual report this spring, but throughout our silver anniversary year, we wanted first and foremost to celebrate what brings us all together and led to the creation of FMR in the first place: our connection to the Mighty Mississippi. 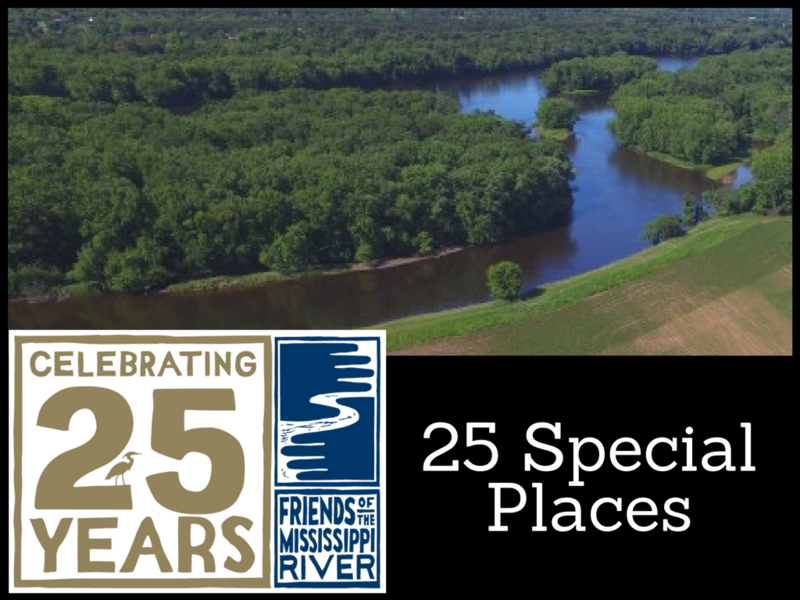 With this, allow us to introduce two new features on FMR.org and Mississippi Messages that will run throughout 2018: the River Story Map and the 25 Special Places maps. 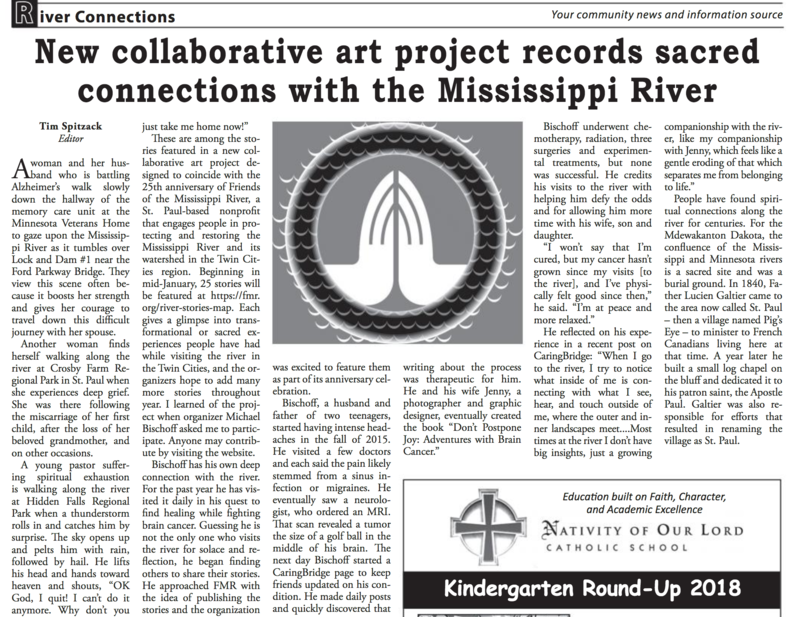 Created and coordinated by volunteer extraordinaire Michael Bischoff, the River Story Map kicks off our silver year with 25+ stories of friendship with and connection to the metro Mississippi. These honest and personal reflections portray the river as a source of intrigue and adventure, a beloved date night venue, and even an unlikely partner in tales of loss and healing. We hope you enjoy them and consider adding your personal story of friendship with the Mississippi River. Note: This project has already been featured in the newspaper, The Voice. We highly recommend the article by editor Tim Spitzak, which includes an interview with Michael about how his personal experience with terminal brain cancer and the healing power of the river inspired this project. Read it online via issu or if you prefer to read it in print, here's a printable version. Each month in 2018 FMR staff will profile places along the metro Mississippi River that are near and dear to us, places that connect to FMR but that we also enjoy in our own downtime. By the end of our 25th anniversary year, our goal is to have a map of 25 special river places for you and yours to learn about, visit and enjoy. While technically north of the boundary of our Mississippi River national park, Houlton represents several ways that people come together to protect the river in partnership and is beloved to FMR staff and community members alike. And with 180 acres of farm fields along the confluence of the Elk and Mississippi rivers being returned to prairie habitat, it's our largest single river habitat transformation yet. Be sure to check out the drone overview of the corn and soybean fields that were here just a few months ago, and make a note in your calendar to return and enjoy the blooming prairie at this same spot this spring! Venture along with us to a few downtown Minneapolis riverfront icons — Nicollet Island, the Stone Arch Bridge and the Mill District. Many of you have been here before, but along the way, we'll be sure to point out lesser-known spots and facts and the scoop on changes to come. April: Hear the roar! Spring waterfalls. Snow melts and cold spring waters trickle down our yards, driveways, and gutters, ultimately swiftening our creeks, swelling our rivers and making our waterfalls roar. Be sure to visit these two waterfalls — one famous, one not so much, but neither to be missed during spring peak. A natural oasis of limestone bluffs, natural springs, oak savanna and hardwood forests, the Mississippi River Gorge is a national treasure in our midst. 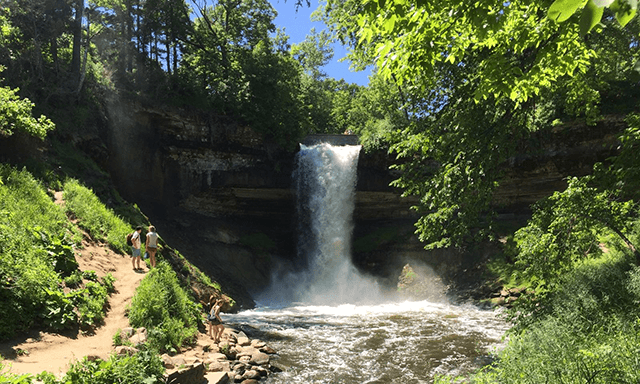 Venture along with us to a few of our favorite river gorge spots: the rare oak savanna, Winchell Trail and the ruins of the Twin Cities' first dam, Meeker. This month in our special places silver anniversary feature, we recommend checking out the miles-long stretch of riverfront parkland on St. Paul's west bank: Harriet Island and Lilydale Park. 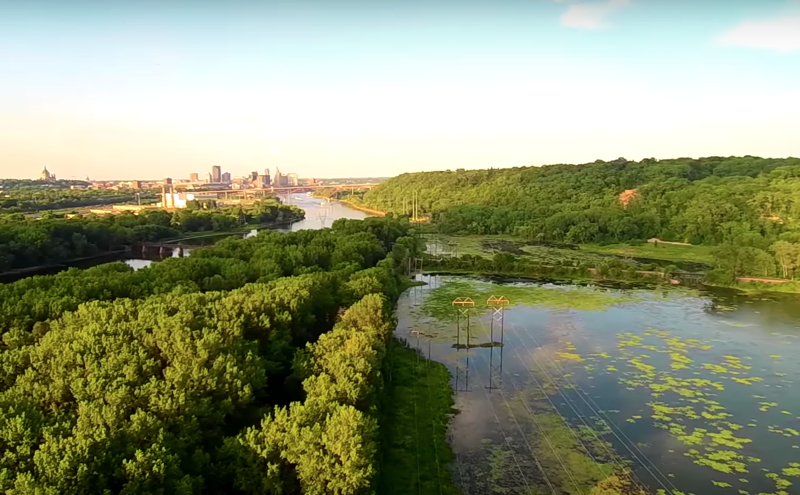 Travel to St. Paul's East Side for a trio of riverfront parks home to stunning views, rich history and restored habitat. Check out Indian Mounds Park, Willowbrook and Pig's Eye Lake. A prairie for every season and (metro) location! We list a few of our favorite prairie sites from Elk River to Hastings, including both restored prairies and native remnants. Some of our favorite finds at each site are listed, and a good time to visit. This month, we suggest a couple of our staff's go-to spots to grab a cocktail (or mocktail) and watch the river flow by. Head to Psycho Suzi's Motor Lounge, Red River Kitchen at City House and Mississippi River Pub to enjoy hometown fare and our hometown river. As the colors turn, it's an especially good time of year to enjoy sweeping river valley views. This month, we're profiling a few of the most stunning metro promontories. River Oaks Park, Pine Bend SNA, Indian Mounds Regional Park and Ole Olsen Park made our list. For our special places feature this month, we highlight the confluences of the Minnesota and the St. Croix with the Mississippi, two tributaries that make our river mighty. There are too many special river places to list — far more than 25 — so we'll close out our series with a few of our staff's favorite spots: the places we visit for solitude or critter watching or fishing, places that connect us deeply to the river and inspire us to do this work. Find out why our staff love Grey Cloud Island near Cottage Grove, Crystal Cove in St. Paul Park, the back channel near Nicollet Island in Minneapolis and the Sand Flats in Minneapolis.